My Aunt Rita always made manicotti for Christmas Eve, and my cousin Barbara continues the tradition today. The family recipe came from my grandmother, who got it from her mother-in-law, a great-grandmother I never knew. When Nanny made manicotti, she used a black iron skillet so smooth and slick from years of use that the pancakes - called crespelle in Italian and crepes in French - slid right out onto a plate. I can picture her standing at the stove, effortlessly turning them out, so it was with no trepidation that I decided to make them for the first time. I was 24 years old and as fearless in the kitchen as I was inexperienced. On my lunch hour, off I went to Woolworth’s to buy an 8-inch cast iron skillet. It wasn’t black; it was disappointingly gray, but it came with instructions how to season it, which I presumed would quickly turn it black and non-stick. Ha. Following the directions more than once – many times more than once - did nothing to make it smooth and slick enough to make the crespelle. No how, no way. After going through eggs and flour at a rapid rate with no success, I picked up the phone in my Kansas City kitchen and called my mother in New Jersey to ask her to post-haste mail me Nanny’s skillet. She just, without thinking or asking anyone (specifically me), tossed out something that today is the kind of skillet articles are being written about and people are scouring backyard sales in search of and, if found, plan to leave to their children. In fact, that very skillet probably – hopefully – found its way into somebody else's kitchen. Meanwhile, back on the ranch, next up was Aunt Rita. Keep in mind, this was a time when long-distance phone calls were punishingly expensive, and random long-distance calls were not in my secretary’s salary bracket. I usually reserved any questions I had for the weekly phone call from my mother on Sunday morning, so my Aunt, who lived in Illinois, was a little surprised to hear from her slightly frantic niece. It turned out she used a non-stick skillet, the kind of skillet most of us wouldn’t have in our kitchens today. 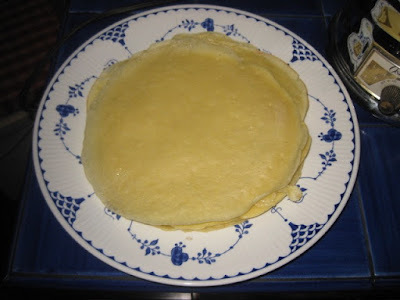 The one I got at Woolworth’s was ugly and flimsy - orange with a gray non-stick interior - but it did the trick, and soon enough, I too was standing at the stove effortlessly turning out crespelle, one after another, onto a plate. To this day manicotti is the only dish I make using a non-stick skillet. I have with success used my 8-inch All-Clad Stainless Steel skillet, making sure I oil it between each crespelle, and someday I will get around to seasoning the carbon steel crepe pan I have, but a good non-stick pan the right size is for sure the easy way out. The crespelle ratio, which can be increased, is 2 eggs, ¾ cup flour, 1 cup water. Whir the ingredients in a blender, and let sit for one hour before making the crespelle. Put a small amount of a neutral oil (I use peanut) in a small dish or saucer. Dip a paper towel into the oil, and swipe it over the bottom of an 8-inch non-stick skillet. Heat the pan over medium heat until hot. Put the 2 tablespoons of batter in the hot pan, and immediately swirl to coat the bottom of the pan. When the crespelle is cooked on one side, turn it onto a plate with the cooked side up. (I just turn the skillet upside down, and it plops right out.) I don't cook the second side. The crespelle can be stacked one on top of another. Keep working until all the batter is used up. Mix the filling ingredients together. Start with the ¼ pound of mozzarella, and only add more if the filling is too wet. Lightly butter a half sheet pan. Coat the pan with a thin coat of whatever tomato sauce you will be using. Take a crespelle with the cooked side up. You will put the filling on the cooked side. 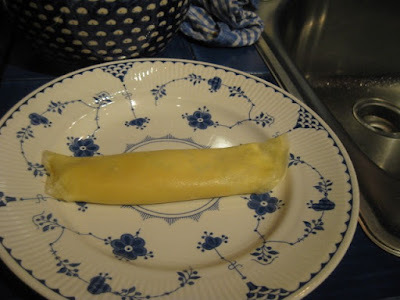 Put about 2-½ tablespoons of the filling onto the crepe, and roll it up loosely like a cigar - definitely not tight as it will puff up when it cooks. Place it seam side down in the prepared half sheet pan. 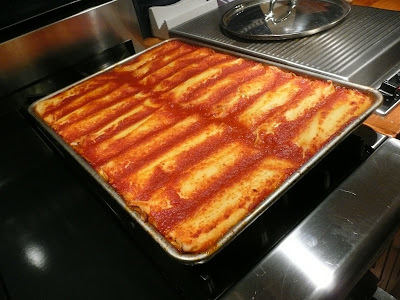 When the pan is filled with stuffed crespelle - now manicotti - put a thin coating of tomato sauce over everything, and place it in a 325 degree oven, and bake for 30 to 45 minutes. You want the manicotti hot enough so the cheese inside melts. You will see it puff up. Serve as is or with a little more sauce on top. Obviously, the recipe can be easily doubled for six to eight people. My aunt used to put the filled unsauced manicotti on top of cornmeal-strewen sheet pans to freeze. Once frozen she would pop the manicotti into freezer bags for easy storage.